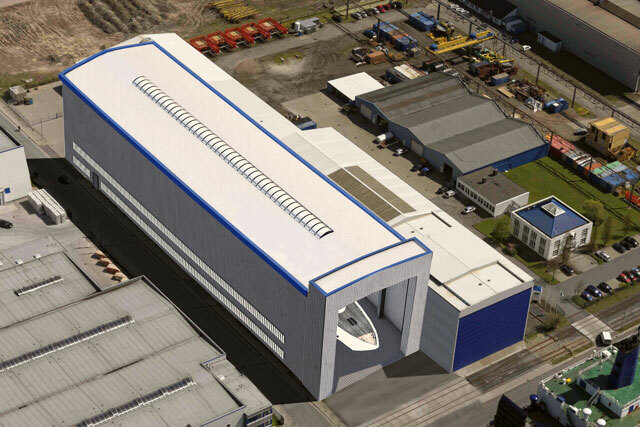 Germany-based Dörries Maritime Services, the consultation and yacht-management company involved with project Graceful at Blohm+Voss at present, has arranged for an unidentified shipyard in northern Germany to build additional megayachts, including a new range starting at 164 feet (50 meters). 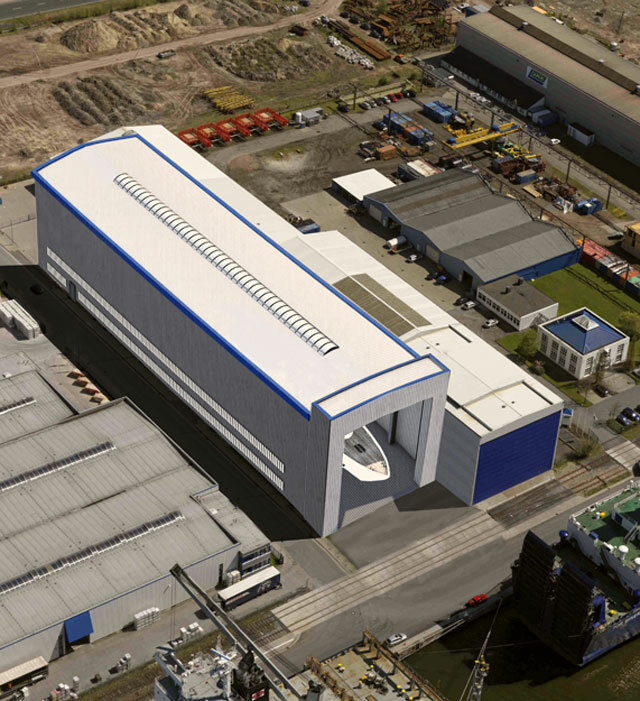 While Dörries Maritime Services does not name the facility (illustrated here), the company issued a statement saying that the shed’s proximity to a good labor pool is among the advantages. Cristian Schwarzwälder, a representative of the firm, adds that the outfitting shed has deep waterfront access, good infrastructure, and experienced support personnel. The goal is to use the facility to build the next megayacht project that Dörries Maritime Services, established in 1987 as an engineering office, is representing on behalf of a client. That contract has not yet been signed, so no details can be divulged. However, Schwarzwälder says, the facility is also ideal for constructing a new range of 164- to 262-foot (50- to 80-meter) megayachts that Dörries Maritime Services is in the midst of developing. Since the outfitting shed can accommodate up to a 459-foot (140-meter) megayacht, multiple orders can be filled simultaneously. Of course, Schwarzwälder acknowledges that such a large shed would permit quite a big project to be built, too. But, there’s good reason to focus on the alternative. “Our strategy includes giving our clients the possibilities to build smaller yachts—less than 70 meters—in Germany, since all of the known yacht builders pretty much start at 70 meters or even 80 meters and bigger,” he explains. Because each size will already be pre-engineered, build times will be shorter, and some costs will be lower. Schwarzwälder raises a good point about the major yacht builders in Germany. Abeking & Rasmussen, for example, has been investing in its facilities over the past year or so to build yachts up to 295 feet (90 meters), up from 262 feet (80 meters). Blohm+Voss is focusing on the 328-foot (100-meter) range, with some clients looking a little smaller and some looking a little larger. Lürssen focuses on the 197- to 508-foot-plus (60- to 155-meter-plus) market. While Nobiskrug is addressing size ranges starting around 70 to 80 meters (230 to 262 feet), it has at least one project in excess of 328 feet (100 meters).